Transforming Hollie: Day 4... Almost forgot! Dinner: turkey meatloaf, sweet potatoes and green beans. I'm doing this daily for accountability. It's 1 am and I'm laying here awake from ruthless cramping. And of course I'm hungry. Dinner was later than usual because I was meal prepping, so I didn't have a good snack like I usually do. 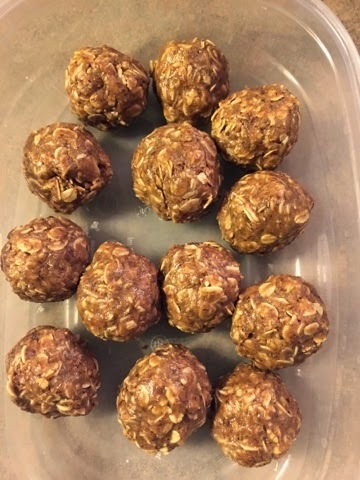 I made protein balls for the first time and ate one of them just to try them. Pretty good, but not as good as my neighbor made them. Mine are dryer, so I'll adjust the recipe next time. Basically they are almond butter, honey, flaxseeds and oats. Next week is my last week of school and my last week of teaching at my current job. Lots of emotions, but I am still excited that the move is so close! We booked a moving truck on Friday, so it's getting real! But with end of the school year comes a lot of eating opportunity. Even if I dodge that bullet, I still have to wrestle with my birthday and graduation the following week. No matter what I'm still glad I did this challenge now instead of waiting. I desperately need to do something NOW. I need the accountability and routine. Even if I can't be 100% perfect. Good for you, Hollie! I am glad that you started now instead of waiting until after all the celebrations. I'm not an expert by any means but I spoke to a nutritionist the other day and based on what he was saying, you are eating too much carbs and not enough protein and healthy fat. Apparently should only be having one serve of fruit and more veggies. Also watermelon is the worst snack as it's pretty much water and so doesn't fill you up- try an apple or something that has more fibre and takes more effort to chew (slows down the eating process which means you actually feel full by the time you finish). Just my suggestions! Good Luck! I have been following your blog for a while now and I truely appreciate how sincerely and honestly you tell your story. I have also struggled with bad eating habits, a lot of cravings for unhealthy foods (or just foods, I really love food!) and a desire to lead a heathier life. I would like to recommend to you an approach that has worked wonders for me: The slow carb diet. Don't be fooled by the name; this is not a fad diet but a complete new take on heating habits which I have found very sustainable (although it did take some getting used to). Basically what you do is this: 6 days a week you eat meals comprised of only three things: vegetables, lean meat, and legumes (i.e. chicken, lentils, and a green salad) and that's it. No dairy, no white starch, no fruits, limited amounts of fat... However, day 7 is a cheat day and then you eat anything you want, in any amount you want! It seems too good to be true, but it actually worked wonders for me and resulted in remarkable fat loss as well as a complete lack of cravings for sugary treats. There are no fees to pay or programs to follow, it isn't low-carb or even low-calorie. And the cheat day is exactly the outled we food-lovers need to stay motivated throughout the rest of the week. Google it and see what you think! I am by no means affiliated with the guy who made this up, but since it worked so well for me and I sense that you and I have kind of the same problem, I just wanted to give you this tip :) All the best, and I will continue to follow you! I'm just getting started. I wish you all the best with your journey and hope you fulfill all your dreams.